Bloomsburg University is located in the Town of Bloomsburg, one mile south of I-80 Exit 236 in north central Pennsylvania. Bloomsburg is the county seat of Columbia County and holds the distinction of being the only incorporated town in the state of Pennsylvania. The town has a population of about 14,000 people. The town has a prosperous business district with more than 80 retail merchants; major chain stores and a mall are also nearby. The Williamsport area: take I-180 south to I-80 east to Exit 236. From Exit 236, take Route 487 south and follow signs to campus, approximately one mile. Short driving distance from Columbia Mall, within 1 hour driving distance of Susquehanna Valley Mall, Laurel Mall, Lycoming Mall. The university is within a 1 hour drive from Frackville, Hazletown, Selingrove/Sunbury, Williamsport, Wilkes-Barre/Scranton; 1.5 hours from Harrisburg; 2.5 hours from Philadelphia; 3 hours from New York City and Baltimore; and 4 hours from Pittsburgh and Washington, D.C.
Home of the Bloomsburg Fair in September. Of course, home to Bloomsburg University. A four-year, public university, Bloomsburg University of Pennsylvania is one of 14 members of Pennsylvania's State System of Higher Education. Founded in 1839 as the "Bloomsburg Literary Institute," Bloomsburg offers 57 Undergraduate Degree Programs, 50 Undergraduate Minors, 20 Graduate Degree Programs, and a Doctorate in Audiology. 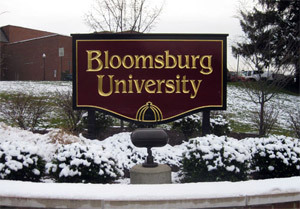 Programs of study at Bloomsburg University include arts and humanities, sciences, education, health care and business. Bloomsburg is recognized as one of the best 100 public universities in the United States due to excellent sports teams, academic programs, and faculty/staff. There are over 9,150 undergraduate Degree and 600 Graduate students, most from the Northeast and Central half of Pennsylvania. Over 57 percent of the student population is female. Bloomsburg has approximately 1,000 employees with 520 full and part-time faculty. All classes are taught by faculty; there are no teaching assistants. More than 250 student organizations call Bloomsburg home. The campus has 73 buildings on 367 landscaped acres, divided into two parts. Lower campus: residence halls, academic buildings, student services, library, administrative buildings. Upper campus: three student apartment complexes, athletic facilities, university maintenance services. The campuses are linked by a shuttle bus that runs throughout the day. The school colors of Bloomsburg University, originally "lemon and garnet," have been maroon and gold since the 1920s. In the early 1930s, the Husky became the school mascot when a dog owned by a faculty member accompanied Adm. Richard E. Byrd on an expedition to the South Pole. Images and information from Bloomsburg University, College Portrait, Columbia Montour Chamber of Commerce, and Derek Stevens.